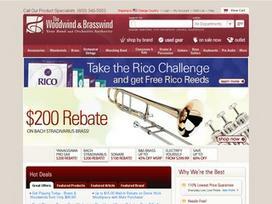 Share what you think about Woodwind & Brasswind, and your favorite ways to save there! I love your store! The reed prices are very competetive and the specials are hard to beat. I personally like to shop your store on eBay because you frequently offer free shipping to anywhere, even Hawaii! As a band director who's been in the biz for over 32 years, I can say without reservation that you guys are the bomb! Thanks for everything!